How can Prisoners re-build their futures BEFORE they are released from prison? Work It Out! provides an empowering and practical approach for finding meaningful work, earning income, building our careers and achieving all that is important to us. It is a completely new approach to work and jobs - one that is particularly beneficial to Prisoners. One of the biggest challenges we face is to ensure that those who are leaving prison build a successful future and do not re-offend. Research has shown that people are significantly less likely to re-offend if they have a job, education, training or other opportunity at the time of leaving prison. When asked which factors would be most important in stopping them from re-offending in the future, 68% of prisoners said “having a job.” However, the changing employment market, huge competition for every available job and a criminal record make that incredibly difficult. A survey by the Chartered Institute of Personnel and Development showed that people with a criminal record are part of the “core jobless group” that 60% of employers deliberately exclude when recruiting. Work It Out! can offer genuine hope for those soon to be released. It is the UK’s most effective ‘back to work’ programme and has already helped thousands of people (particularly those in difficult circumstances) to find work, earn income and rebuild their career. Individuals no longer need to leave prison hopelessly reliant on an outdated work model. Work It Out! can offer prisoners a completely new and effective way to rebuild their lives. It can also deliver a new support framework to help ensure that individuals avoid reverting to a position where repeat offending is likely to occur. 1. Individuals are encouraged to work towards creating an alternative or better future. This involves skilled facilitation to enable them to look beyond the current (ex-con or political prisoner) mind-set. 2. Participants are encouraged to think about what they would really like to do, even if they don’t currently see how this is possible. This is a key element not generally addressed by current resettlement plans. Work it Out! teaches how ‘workpieces’ can be created that can progressively make aspirations a reality. This process is empowering, motivating and focuses effort and energy on positive goals. 3. A structured programme of training and development is put in place which responds directly to individual and group needs in line with 'future life' scenarios. This builds directly upon individual skills, interests and strengths in new ways. 4. Project development activity evolves from the above so that new and additional work, income and career scenarios begin to be created and developed before prisoners are released. Individuals no longer need to leave prison hopelessly reliant on an outdated and largely ineffective work model. Work It Out! can offer prisoners a completely new and effective way to rebuild their lives. What’s more, Work It Out! can deliver a new support framework to help ensure that individuals do not put themselves in a position where repeat offending is a viable option. Work it Out! is delivered with an initial Half Day Workshop. Following this, individuals sign up for the Six Week Process. In a packed three hours, returning citizens will learn about a completely new approach to work with helpful case studies, challenging ideas, strategies and practical advice. They will begin to believe that they can harness their skills, experience and ideas to develop new opportunities, income streams, find work and build a future that would really interest and motivate them. Following the initial workshop participants have the opportunity to sign up for the six week Work it Out! process. This consists of facilitator supported session (each lasting two and a half hours) every week along with tasks and collaborative working activities. This six-week period will encourage and support participants to explore ideas and possibilities further and to start to develop their workpieces in the weekly practical sessions. Collaborative working is encouraged and individuals are encouraged to support one another. Throughout the six weeks, participants will be supported by individual career coaching where required. Cost £6,000 (inclusive of all costs for the six week programme). Excellent programme! It has helped me to think differently. We will now look at how we do things. Excellent, interesting and very informative. Good flavour given! Allows 'out of the box' thoughts. This will help us to look at things differently and change our approach. We will increase knowledge externally of employability opportunities. Very informative, inspiring and enjoyable. Impressed by the alternative approach. 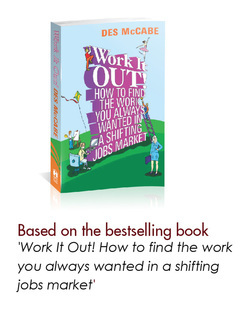 Work It Out will help offenders to identify skills that they have and how too utilise them. This approach creates a more diverse approach to employability. We will create a case for piloting Work It Out at our prison. Impressive! Food for thought. We will explore options for a pilot. Unsure at the start but now enlightened! Helps us to focus on how the programme can help offenders at our Prison. We will revisit our internal resettlement process in the light of this. Very good! Exciting! A new project to take forward with our Director. Good! This has given us some new ideas. We will start to look at partnerships externally. Excellent, Interesting and very informative! This is giving us new ideas to incorporate into our employment programme. We will look to integrate the workpieces idea into our current activities. Really enjoyed it - thanks! This will help us to think a little differently and be creative. Very good! We can now look at the whole area of work differently. This will help prisoners realise their potential. Interesting - we need to ensure that there is the opportunity to support others to work creatively. Good, informative and very interesting day! Helped us to become open to other concepts. Excellent! Very informative and thoroughly enjoyed the delivery. We will investigate further partnerships to enhance resettlement opportunities.